Letter to Mary Johnson of Worthington, Ohio from Thomas S. Fuller of Milan, Ohio from the collections of the Worthington Historical Society (WHS) may be used for educational purposes as long as it is not altered in any way and proper credit is given: "Courtesy of the Worthington Historical Society, Worthington, OH." 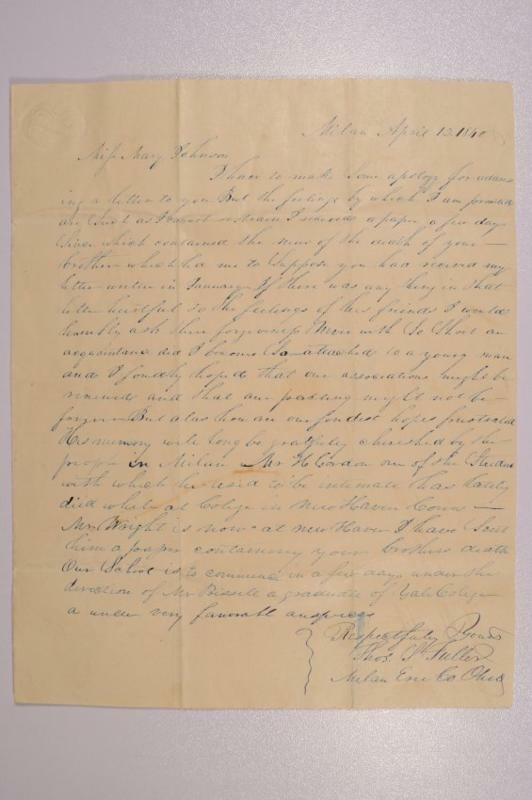 Prior written permission of the WHS is required for any other use of Letter to Mary Johnson of Worthington, Ohio from Thomas S. Fuller of Milan, Ohio. Contact WHS at info@worthingtonhistory.org to request permission. Letter to Mary Johnson of Worthington, Ohio from Thomas S. Fuller of Milan, Ohio is text, with genre letter and correspondence. Its dimensions are 11 in. x 8.5 in.. It was created on Sunday, April 12, 1840. Worthington Historical Society is the Contributor. Mary Sessions (née Johnson), 1823-1919 and Thomas S. Fuller are the Correspondents. In this letter written to Mary Johnson, Thomas S. Fuller of Milan, Ohio sends his regrets on the passing of her brother William. It is not clear whether Thomas was a friend, an authority figure at the school William was attending, or simply an acquaintance. He references a letter that he wrote to Mary in January where he may have written something disconcerting about William that would have upset his family and friends and asks for her forgiveness for any ill feelings he may have caused. He closes the letter with some lines about what a fine man William was. William M. Johnson was Mary's brother. He was born in 1818 and died in 1840. It features the people William M. Johnson, 1818-1840, Thomas S. Fuller and Mary Sessions (née Johnson), 1823-1919. The Worthington Historical Society identification code is 2012.0005.99. The Worthington Memory identification code is whs1000. This metadata record was human prepared by Worthington Libraries on August 29, 2017. It was last updated October 26, 2017.